Even if you are a complete beginner to the blues, this course will give you everything you need to truly master blues harmony and enjoy improvising over the blues. Learning to play the blues will enrich every aspect of your playing, and it will give you countless opportunities for creative jamming with other musicians. Do you wish you could jam with other blues musicians and improvise effortlessly? Would you love to be able to play any blues song you hear without the need for sheet music? Does blues music touch something deep inside you, making you want to play it yourself? Do you struggle to make sense of blues harmony with its "different" sounding scales? Get the help you need to start jamming! Playing and improvising over the blues is one of the great pleasures of modern music. And it's absolutely available to you right now. All you need is an organized path that introduces you to this beautiful art form in a complete, step-by-step way. Even if you are a total beginner to the blues, this course will enable you to truly understand blues music and enjoy improvising over the blues. You'll learn to improvise over a wide variety of blues chord progressions. And you'll learn to understand the chords and scales used in the blues so you can play confidently with other blues musicians. In IFR we believe that musicians who follow their imagination are the ones who change the world. In this course you won't just be learning to copy someone else's "licks". You'll be learning to play your own original solos and melodies over any style of blues. A deep understanding of the 12 bar blues chord progression, broken down into easy steps. Mastering the chord and scale alterations that define the blues sound. How to integrate "blue notes" and the blues scale into your musical vocabulary. A deep dive into the minor blues. Understanding blues poetry and using this form to create powerful solos. Many rhythmic styles including Chicago blues, New Orleans blues, R&B funk blues, Latin blues, rock blues and more. The jazz player's blues, with complete analysis of all chord substitutions. Special song forms like the 8 bar blues and 16 bar blues. Every lesson in this course comes with backing tracks in all 12 keys. If you're a beginner, you can learn the blues in the keys you're most comfortable with. If you're more advanced, you can target the keys you especially want to work on. This course gives you the foundation for a lifetime of creative improvising over the blues. There is a LOT of material here, and I encourage you to really take your time and enjoy each moment. A deep understanding of the blues will enrich every aspect of your playing, adding a whole new dimension to your music. And learning to play the blues will give you countless opportunities for creative jamming with other musicians. The entire course costs just $49. You can access all of the lessons and audio tracks online at our website or download the entire course for your offline use. 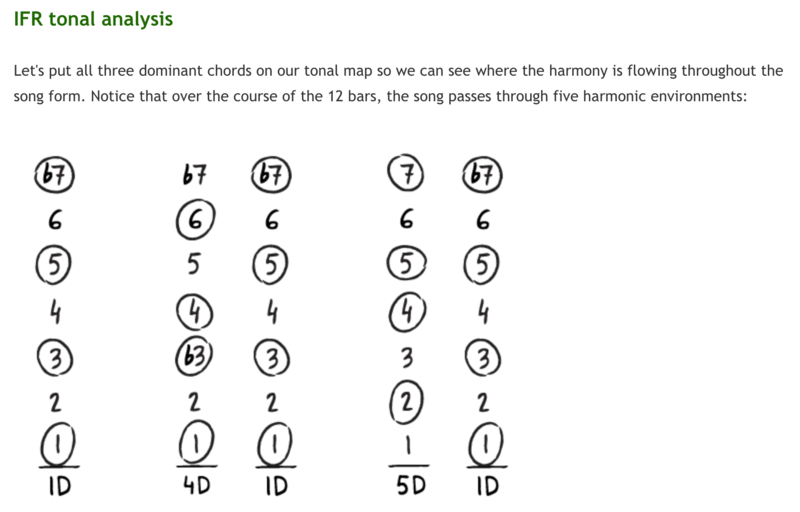 Each lesson can be downloaded as a PDF containing all text and illustrations, with backing tracks in mp3 format. All materials are yours to keep forever. Just click on the “Add to cart” button to purchase the IFR Blues Mastery course for $49. You can make your purchase with any major credit card and access all course materials immediately. And if you don't absolutely love the entire course, just send us an e-mail within 60 days and we'll give you a full refund.